The beautiful remote Canadian lake has provided a bountiful supply of fresh fish. 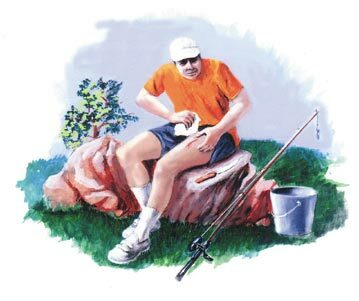 You are cleaning the catch when a moment’s inattention allows the knife to slip and create a deep slash into your leg. The bleeding is stopped with pressure; but now what do you do? Where is that kit with the medical instruments? When did you last check them for sterility? Where is that book on emergency medicine and exactly how do you make those sutures? There is a common misconception that wounds need to be closed in order to heal. Texts on wilderness medicine will include sections on suturing techniques and equipment. They list recommended instruments, suture materials, and methods of making stitches. Unfortunately they don’t mention that suturing is an acquired skill and not easy to do, especially on yourself. Also, anyone who is planning to suture every laceration or wound that occurs in a remote location had also better learn the signs of several interesting wild creatures such as clostridium tetani (tetanus), clostridium perfringens (gas gangrene), staphylococcus, streptococcus, and pseudomonas. Surgeons divide wounds into four categories: clean, clean-contaminated, contaminated, and dirty/infected. The differences between each class are determined by the amount of bacterial contamination expected in the wound. The first two categories are for patients in a hospital. A clean wound occurs when prepared (cleansed) skin is opened in a controlled fashion and no internal organs are entered. Hernia repair is a good example. Clean-contaminated wounds also happen in operating rooms, as when an internal organ is operated upon under controlled circumstances, often with antibiotic coverage. A good example is an appendectomy. Contaminated wounds include open fresh traumatic injuries or surgery with bacterial contamination from an internal organ. Slashing your hand with the same knife you have been using to clean fish or game would be a good example of the former. Dirty and infected wounds contain dead tissue, pus, foreign material (e.g. wood, grass, etc. ), gross contamination (e.g. dirt, manure) or are contaminated wounds that have received no treatment in the first hours after injury. Obviously, the dirtier your wound the greater likelihood of a subsequent infection. This is especially true if you suture up the wound and trap the contamination inside. Bacteria in a warm, closed space feed on bloody injured tissue and are able to multiply rapidly. Using chemical bulldozers they are able to spread into the surrounding healthy tissues causing an infected wound that is red and drains pus. If drainage doesn’t occur they can spread through tissue planes causing fasciitis, the so-called flesh eating disease, or spread throughout your entire body causing fatal infection. With proper cleansing and antibiotics a contaminated wound can frequently be closed without infection but even surgeons in a hospital will usually leave a dirty wound open initially. This allows the fluid and bacteria to drain from the wound and antibiotics to kill the invading bacteria. After the wound has been repeatedly cleansed and treated with antibiotics, closure can be accomplished with little chance of infection. Can you get to qualified medical care within six hours? a) Stop the bleeding with pressure on the wound. b) Once bleeding has stopped, gently clean out any gross debris, such as wood particles and rocks, but don’t do it so vigorously that it restarts the bleeding. Also remember that this area may be very painful so don’t torture yourself or your injured companion. If you carry local anesthetics in your medical supply kit now is the time to use them. You can inject with a needle but it can also be effectively used by dripping some into the wound. When it numbs the site a little, wet a gauze with the rest and place it in the wound. After a few minutes the wound will be less painful and easier to clean. c) Place a sterile gauze or clean piece of cloth into the opening and wrap the site with gauze or an ace wrap. If it is near a joint, try to immobilize the joint to prevent further bleeding and pain. d) Transport expeditiously to a hospital. Don’t take any antibiotics unless it is going to be a long trip. The hospital personnel will likely sample the wound for bacteria and prescribe appropriate antibiotics. If you have a long transport and carry antibiotics, cephalexin or ciprofloxacin would be good choices. e) If there hasn’t been a lot of blood loss and the person isn’t nauseated, give them some pain medication for the trip. a) Stop the bleeding by pressure on the wound. b) Once bleeding has stopped, gently clean out any gross debris, such as wood particles and rock, but don’t do it so vigorously that it restarts the bleeding. In this circumstance try harder to physically remove the materials. If you have access to a lot of water, irrigate the area thoroughly. The water won’t be sterile but shouldn’t be grossly dirty or contaminated. Again, do not clean so vigorously that you restart any bleeding, and make use of any local anesthetics as directed above. c) Place sterile gauze or clean cloth into the wound as deep as you can without causing undue pain. Cover the site with more gauze pads, and wrap the site with gauze or an ace wrap. If it is near a joint, try to immobilize the joint to prevent further bleeding and pain. d) This wound will seep a lot of fluid and the dressing may need to be changed frequently in the first 48 hours. Make an effort to cleanse the site with water and then replace the gauze pack. Removing the pack will help to remove a lot of the debris that you couldn’t easily get out initially. After several days the wound will not be nearly as painful and the dressing change will be easier to do. e) If you have antibiotics go ahead and take them in this circumstance. Topical antibiotic ointments such as Bacitracin, Triple Antibiotic, or Bactroban could also be helpful. I would place some on the gauze that is placed into the wound. If there has been extensive blood loss, an open fracture exists, or there are other serious associated injuries (head, chest, abdomen) begin expeditious transport to medical assistance or use any available communication to summon help to the scene. If this is simply a contaminated laceration and you have adequate dressing supplies, you may continue to treat the wound in an open fashion. It will heal on its own in two to four weeks. It may leave a wider scar than desired, but you can later find a plastic surgeon who will revise it.